The sleepy town of Minna was woken up again as it’s most illustrious son, former President, Ibrahim Babangida gave out his last daughter, Halima in wedlock last Friday, 12 May 2017. She got married to Alhaji Auwal Abdullahi, a successful businessman. It was another major event that the town is not likely to forget in a hurry. Whether or not you like him, you cannot deny the fact that General Ibrahim Babangida is the most sought after among the former leaders of the country. His friends claim he is an institution. Despite leaving office about twenty four years ago people still flock around him, be they politicians, businessmen and businesswomen, industry movers and shakers top military and paramilitary buffs. All want to associate with him, even out of power. Here, we are not talking about the common crowd of bootlickers and palace crooners. s willing to shake hands with all despite his frail health. 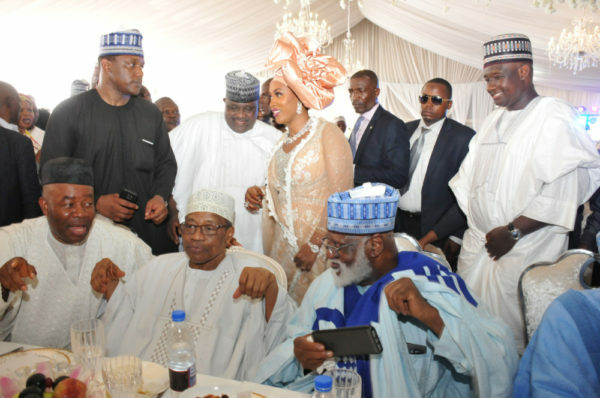 Between twenty eight and thirty private jets landed and took off in Minna for the wedding of Halima Babangida. Close to that took place years back when her sister and brother wedded. This time former President Jonathan and wife, were among the earliest arrivals. Tinubu, Dogara Saraki, FG delegation, governors. AIG Imokhuede, Aliko Dangote, Dr Mike Adenuga and many others flew in in private jets no thanks to the deplorable state of the roads leading to Minna. It was an event in which you easily count those who mattered but were absent rather than those who mattered and came. While the number of private jets could be easily put at thirty, the names of the top dignitaries who came wasn’t so easy. There were two former Nigerian leaders, the immediate past President Goodluck Jonathan who came with his wife, Patience as well as home boy, Abdusalami Abubakar who is a neighbour to and usually stands in for the father of the bride. 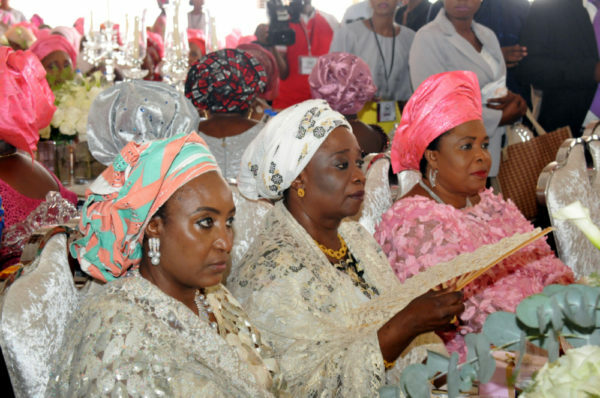 Also in attendance were wives of former leaders, Mrs Ironsi, Turai Yar Adua, Ajoke Mohammed, Justice Fati Abubakar, Patience Jonathan, Hajiya Sambo. Other leaders were Senate President Bukola Saraki, Reps Speaker Dogara, Governors of Taraba, Yobe, Gombe, Sokoto, Kebbi, KANO, Kaduna, Plateau, Imo, Cross Rivers, Osun, Zamfara and host state, Niger were all in attendance. So also did Ministers of Defence, Interior, Minister of State Solid Minerals as well as four other colleagues came. They all came together with the Chief of Staff to the President, Abba Kyari. Former governors were not left out. Notable among those who attended the wedding were; Senator Rabiu Kwankwaso, Sule Lamido, Senator Akpabio, Babangida Aliyu, Aliero, Olagusoye Oyinlola, Isa Yuguda, Shema, Ezeife, Ali modu Sheriff, and Bafarawa. Other top politicians were not lacking, Kashim Imam, Saeki Mukhtar, Shehu Sani, Dino Melaiye, Gbenga Daniel, Abike Dabiri the President’s SSA on Diaspora, former FCT Minister Modibbo, AIT boss Dokpesi, Jubril Aminu, Mohammed Abacha and wife. Mike Adenuga, Aik imokhuede, Otedola, Dangote led the pack of businessmen. Society ladies were not left out, Abba Folawiyo, Dupe jemibewon, Ronke Ayuba, Chief Mrs Felicia Sani, Bola Shagaya, Folorunso Alakija, Lady Tumi Akogun, Hajiya Afficent, Tabitha Kwajafa and her adorable and ageless mum, Hajiya Gambo Suwaira, Sade Bent, to mention a few. The IBB boys were also there. Among them were Senators John Shagaya and Tunde Ogbeha, Col Dangiwa Umar, Abdulmuminu Aminu, Akilu Halilu, Olagunsoye Oyinlola and others. Alhaji Auwal Abdullahi, the businessman who married Halimat Babangida, paid a symbolic bride price of N500,000 and 10 cows to her father, former Military President, General Ibrahim Badamosi Babangida. The groom is the Sarkin Sudan of Gombe, in Gombe state. Gen. Garba Wushishi performed the symbolic ceremony of handing over Halimat at 2.45 pm in marriage to Abdullahi. Gov. Ibrahim Dankwanbo of Gombe state received the bride on behalf of the groom, who hails from the state. A special prayer by Sheik Kabiru Gombe was offered for the couple. He stressed the significance of marriage in Islam and called on the bride to submissive and loyal to her husband. Virtually all the former First ladies in the country who are still alive were around for the event as stated earlier. Aisha and her brother Mohammed seemed to have perfected the art of dragging all.of them out as they promised to do it ever before the event and they did it. If there was anything at all, Aisha proves that she was indeed a chip of the old bloc as she danced like her mother would do and ensured that all were taken care of. A proud Nupe woman, her peoples culture and meals were served at evey event during the wedding, which also was another trait taken from her mother. Well, even though there were no popping of champagne, you could not but notice that everyone had more than enough to eat and drink in all the programmes. Indeed, the eating started ever before most of the events and continued way after events had been declared closed. The caterers were many Astoria from Abuja was conspicuous. One thing that was also obvious was the preference for locally made drinks like Zobo , Kunu, ginger, Kunu samiah and juice rather than the bottled or canned drinks from Coca cola Pepsi any soft drink brand. It was local drinks all the way. Producers of special local delicacies seemed to have found a major opportunity to promote what they had as they really had field day. Some even had corners inside Babangida ‘s hilltop mansion where they exhibited their products and served people during the post –wedding reception. Many Niger State delicacies and snacks were in good supply. It was a society wedding where no coke fanta, sprite or malt of any brand was served yet, there was much to drink. Later, we were told that it was indeed an intended plan meant to showcase what the country can do, the resources the country has and indeed, follow up what the matriarch of the family stood for when she started Better Life for Rural Women which was to encourage local productivity. The relationship between the Babangida family and Nigeria’s richest woman, Folorunso Alakija goes far. It is a well known fact that the Babangida family made her. Alakija was the official tailor of Maryam Ndidi Babangida, the late matriarch of the family. And she was said to have been instrumental to how she came about her wealth. 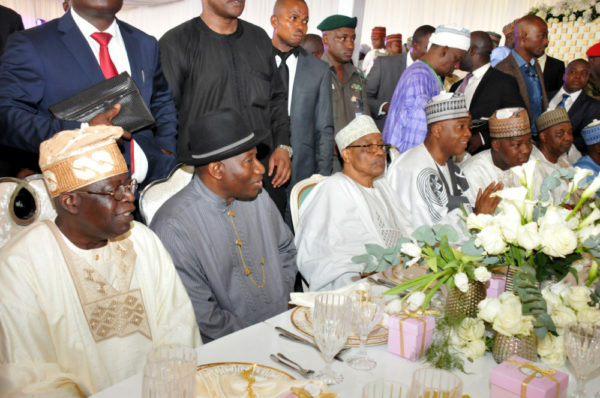 Invariably, Alakija was at the wedding to show her loyalty and appreciation. Led by the Minister of Defence, it was indeed a powerful delegation. Others in the delegation as stated earlier are the ministers of Defence, Education and Minister of State for Solid Minerals. They were all there live. She is a good events planner. She is also a damned good compere but what many may not know about her was revealed by no one else but Dayo herself as she anchored virtually all the programmes of the wedding albeit with a few helping hands like Willy Willy of Wazobia FM Abuja. According to her, the late Maryam Babangida gave her her first break in the business of events management when she started off and because of that she owes the family a lot. Since then, every major event involving the family ha always been with her playing a major role. She is virtually seen as a member of the family. How does IBB remember all these people? One of the things about IBB is that he has so many loyalists. But how he keeps a tab on them is what many who spared time to see His table would notice that he had no free time to himself; a minister coming to say hello, a politician coming to show appreciation or even a driver coming to say it has been quite a while. He is undoubtedly a man of the people despite his age and in spite of the fact that he left power over twenty years ago. The bride price which was paid at the wedding fatiha presided over by the Emir of Minna was five hundred thousand naira. Imam was PDP man in Borno up til the last election. A former member of the House of Representative, he was around Asiwaju Ahmed Tinubu as if his life depended on him. Curiously, when Asiwaju left the main building on the Hilltop, the first person he asked for was Imam. It is not for nothing that they call him Maradona. IBB again pulled off what many would think undoable as Tinubu sat side by side with the man he virtually removed from power in 2015. Since the elections, it was the first time both would be together in a room and there they sat side by side like school children at a debate each acknowledging fraternal greetings from admirers and followers alike. You definitely needed to bevtrim to be Mohammed Babangida. He was right there beside his father, on his feet, yes on his feet all through all the events that lasted about four hours. Guess he had been standing ever before the event started. And that’s the price you have to pay if you are the scion of the most influential former ruler in Nigeria. There were no sirs around IBB. No military or police presence that was not breachable, it was just Mohammed ensuring that the man listened to all and his old wry gap- toothed smile remained. They were there. Friends of the bride, young friends, older friends. 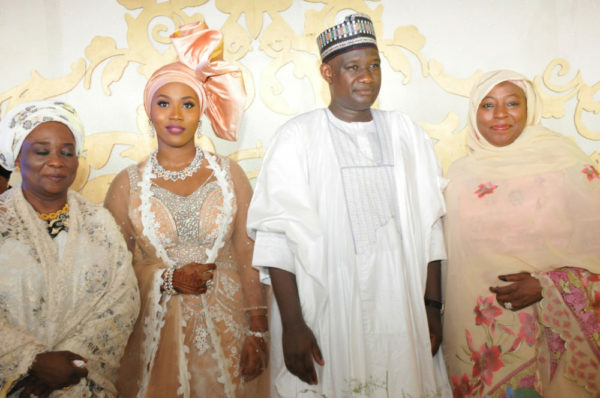 Halima Dangote and her younger unmarried sister, Governor Bello,Niger state Governor’s sister who incidentally attended Al Amin School which was founded by Maryam Babangida and which Halima attended was also there. Indeed, over ninety of her friends from Am Amin were there to rejoice with her.